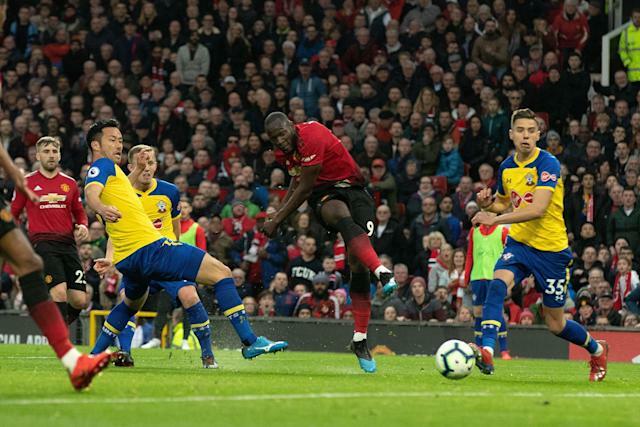 Manchester United took advantage of an Arsenal slip in the North London derby to move into fourth place in the Premier League table by beating Southampton 3-2. Romelu Lukaku scored twice, including the winner in the 88th minute, to outlast the Saints in a thriller at Old Trafford. Manchester City, meanwhile, rode a 55th-minute goal from Riyad Mahrez to topple Bournemouth 1-0 away and leapfrog Liverpool into first place, putting pressure on the Reds as they travel to face arch rival Everton on Sunday. James Ward-Prowse scored Southampton’s second goal midway through the second half before Lukaku’s winner. Thanks to Arsenal’s draw against Tottenham in the North London derby, United now sits fourth, one point ahead of the Gunners. Lukaku, meanwhile, has scored four times in his last two matches after a brace against Crystal Palace midweek. No, Palace and Southampton aren’t the strongest competition, but they represent the kind of victories United can now be expected to earn under manager Ole Gunnar Solskjaer, who runs his league record to 10 wins and two draws in 12 matches since taking over mid-December. The loss has to be a tough blow for Southampton, too. An unexpected away point vs. United could have proven crucial in the Saints’ fight to avoid relegation. They still have their toughest remaining games (Liverpool, Spurs, Wolverhampton Wanderers) at home, with a slew of fixtures remaining against the bottom half of the table, so they’re still in decent shape to ultimately avoid the drop. But it sure seemed like a point was in the offing at Old Trafford. Now they have to regroup. Manchester City retook first place with a convincing effort, even if the score line was unflattering. Mahrez came on in first-half stoppage time for Kevin de Bruyne, who appeared to suffer a dreaded non-contact injury. The Belgian star has already endured two extended spells on the sideline this season due to knee issues, first from mid-August to mid-October and more recently from November 1 to December 15. If there’s any good news for the reigning English champions, it’s that they’ve become accustomed to playing without de Bruyne, and once again top the league table with 71 points. Liverpool is two back at 69, with Sunday’s Merseyside derby lingering. The Reds have answered pretty much every challenge thus far this season, but City will surely keep mounting them. Crystal Palace put three past Burnley to cruise to a 3-1 win at Turf Moor, while Florin Andone’s 79th-minute goal ignited the Amex Stadium and lifted Brighton & Hove Albion past Huddersfield Town 1-0. Michy and Wilfried Zaha scored for Palace, which also benefited from an own goal by Phil Bardsley and vaulted up to 13th in the table with 33 points. Ashley Barnes scored for Burnley. Brighton, meanwhile, secured three points it absolutely had to have against last-place and relegation-doomed Huddersfield. The Seagulls moved to 15th, five points above the drop and ahead of Burnley on goal differential.